Mary Browne, CSP is someone who started her career in selling safety materials and equipment. Fast forward to today, and she is the District HSE Manager at Nordic PCL Construction, Inc.
Nordic PCL is a general contractor that was established in Hawaii in 1938 under Nordic Construction Ltd. and merged with PCL Construction in 2008, after completing several joint ventures, including the $200 million Hawaii Convention Center. Today, Nordic PCL brings together the best of both worlds—local market knowledge and financial strength with global resources. They deliver pre-construction, estimating, operational, general contracting, construction management, and design-build services to clients in the hospitality, commercial, education, mixed-use residential, aviation, and other industries. 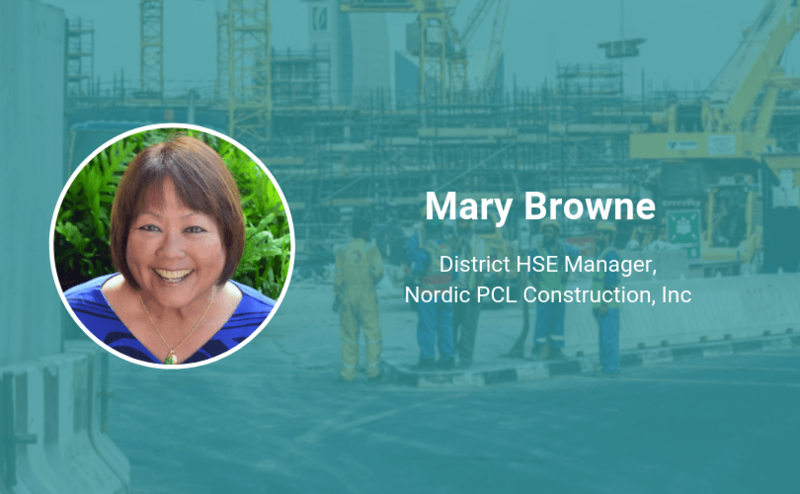 With the highest standard for supporting safe working conditions on every project site, Mary is a strategic, people-focused leader—one who also has a strong attention to detail. She’s also a lifelong learner, and someone who is committed to continually growing as a leader. Keep reading to learn why she says “safety is common denominator,” why she says collaboration is so important, and who she says has helped shape her approach to safety throughout her career. How did your career in safety start? I started my career selling safety materials and equipment at Gaspro, aka Airgas. Learning about safety equipment and working with various companies who utilized them peaked my interest, so I went back to school to pursue a degree in Occupational Safety and Health. From there, I worked in insurance loss control, aviation safety, property management and then I fell in love with construction. Have you ever had an experience, incident or situation shape your approach to safety? No matter what industry you work, safety is a common denominator. When I started in construction, I knew absolutely nothing about the industry other than big equipment was used and workers wore hard hats. On top of that, construction was truly a male dominated industry at that time. Being a female safety professional in construction was unheard of and I almost didn’t get the job because the company didn’t think I would be taken seriously or be accepted. I learned from the best teachers I could possibly have—the workers themselves. Being a great safety professional doesn’t mean you have to know everything, but you must be open to learning new things all the time. Admitting that you don’t know something makes you human. Being humble and showing a willingness to learn earns you respect. Is there anyone who has helped you learn about safety? I was very fortunate to have several older and experienced safety professionals provide mentorship as I was coming up in safety. The thing that made the biggest impact was learning that safety is not a trade secret. If you truly want to make the world a safer place, we all need to collaborate and share information. Don’t waste time reinventing the wheel. Network with others to come up with viable solutions. Safety is not for soloists; its success is dependent on team effort. I am an excellent listener! Focus on what is being said and clarify what you heard before providing a response. Remain calm and keep emotions in check. Breakdown in communication often happens when a response is formulated before hearing the entire conversation. Stay focused and be an active listener.